Introducing the hospitality industry to schools. Giles Thomas, Operations Director of The Manor Collection hotel group is an Enterprise Advisor for The Priory School in Dorking. This involves encouraging year 11 students to think about what career they would like to go into. 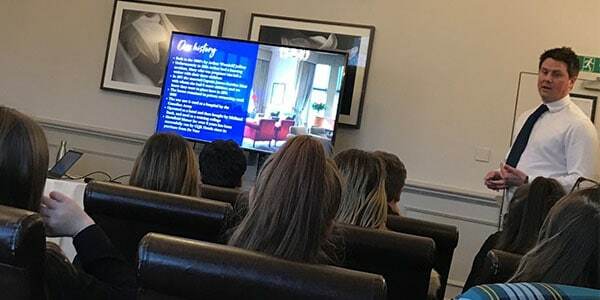 Giles encouraged the students to consider a career in hospitality by inviting them into one of the groups hotels, Hartsfield Manor in Betchworth for an afternoon. The Session involved a presentation from Giles himself explaining the different areas of a hotel and what’s involved in the industry. The students were taught about the types of events that take place in the hotels and the variety of guests who might stay. The hotels Marketing Manager gave a presentation explaining how they market the properties and events and the different channels they use and the HR Manager gave an in depth presentation about the different roles within a hotel and how one can progress towards management. Following the presentation the students were taken on a tour of the hotels conference centre and bedrooms and then taken into the restaurant and kitchen where the Head Chef de boned a chicken and prepared a dish from the wedding menu.